University President- Dr. Milabel Enriquez-Ho, CSS Dean-Dr. Rufina A. Cruz and WMSU Histourist’s President Mark Titus Carbonell hand the tokens to the speakers, Mr. Reyes and Mr. Salubayba. 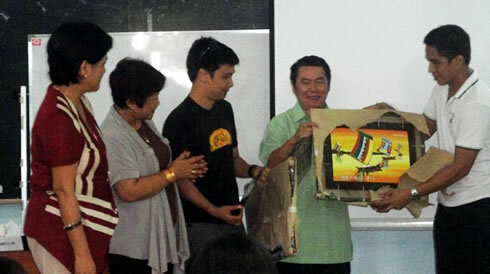 Departments of History and Social Studies of the College of Social Sciences (CSS) of Western Mindanao State University (WMSU), in partnership with the Bank of the Philippine Islands (BPI) sponsored a Forum on Histoart: Art History, History in Art held last October 23 at the Moot Court, College of Law of the university. Niña Mirrela C. Bautista of the BPI Foundation said that this is a team up with Filipinas Heritage Library (FHL) which delivers the Herencia lectures on Philippine Art to the different schools in the country. It aims to address the lack of art education projects and training programs in the country. The said activity was made possible through the initiative of our University President, Dr. Milabel Enriquez-Ho. She lauded the support of BPI and Filipinas Heritage Library for bringing two renowned artists WMSU to speak on important topics namely: Don Salubayba who lectured on “History of Philippine Art” and Cid Reyes who spoke on “Current Trends/ Breaking Barriers in Global Art”. Salubayba, is a painter, puppeteer and animator. He has also participated in multimedia festivals, and exhibited his works at various galleries and museums, in the country and abroad, which he was awarded as the Thirteen Artists Awardee by the Cultural Center of the Philippines in 2009. On the other hand, Reyes is an artist, writer, and art critic. He has authored many books on art and culture. He is also a seasoned advertising executive, wherein he handled successful campaigns such as “Sanlibong Mumunting Araw” and “Kahit Di Magkula” for Tide; “Kutis Porcelana” for Camay; and “Huwag Maging Dayuhan Sa Sariling Bayan” for domestic tourism. Dr. Rufina A. Cruz, CSS Dean, thanked the guests and speakers for the opportunity given to the History students to listen to these two great artists. Dr. Ho was presented with a coffee table book entitled: Herencia: A Legacy of Art and Progress, a 360-page book which contains in-depth reviews of nearly 1,000 important works of art accumulated by BPI in the course of its ten mergers and acquisitions – from People’s Bank and Trust Company in 1974 to Prudential Bank in 2005.